One of the great allures of golf is the variety of courses—and the variety of reasons to like courses or not care for them. Another appeal of the game is the opportunity our golf-course opinions create for writing and thinking about what makes a great course. We not only can question conventional wisdom about a golf course’s greatness. There’s also room for giving overlooked golf courses their due. This is not only fascinating. It’s a practical exercise that helps us choose where we want to play. 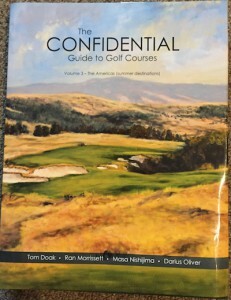 And that is what’s so cool about “The Confidential Guide to Golf Courses,’’ a five-volume set that brilliantly reviews and describes the golf courses of the world. The books are a labor of love for renowned course designer Tom Doak and his three co-authors. The reviews are concise, and each course receives a rating of from 0 to 10. The books also include a variety of lists—hardest courses, most fun to play courses, bumpiest courses, most comfortable clubhouses, best clubhouses for lunch, and on and on. The books are a great read for you, and the golfers in your life. What a nice Mother’s Day or Father’s Day gift idea. Check them out here. They are books that you can read straight through, from beginning to end. But I find them much more fun to peruse. What do they say about this course or that course? What courses should we try to play on a particular trip? What trip should we plan next to enjoy some intriguing new courses? The fascinations go on and on. Erin Hills received a 6,7,6,6 rating from the four reviewers. The Confidential Guide is divided into five volumes: Volume 1, Great Britain and Ireland; Volume 2, The Americas, Winter Destinations; Volume 3, The Americas, Summer Destinations; Volume 4, Europe, Middle East and Africa; Volume 5, Asia, Australia and New Zealand. I have played all but Gullane, and concur with the list. It brings a smile to my face, just recalling those names, although I could easily add 10 or 15 more courses. `They’ must have read the Doak assessment. Because the Cruden Bay we experienced was wonderful and playable. The authors, by the way, gave Cruden Bay an 8,8,8,7 rating. All I’ll say is, if you play Shiskine, you’ll have a blast. And because it has seven par-3s and a low greens fee, you can go around twice. Don’t miss lunch in the homey clubhouse. My Shiskine review is here. Obviously, the assessments of Doak & Co. are spot-on for golf’s legendary courses. What makes their writing irresistible is that they are not golf snobs. I’m a believer that golf is where you find it. And they are, too. I was very impressed that Mr. Doak had an entry for Traigh, a delightful nine-holer far off the traditional Scottish golf path. He even gave it a 5 rating. The golf is quirky and fun—and the people to be met there also answer that description. What really blew me away is that Mr. Doak had entries for a couple of modest, but interesting Chicago-area tracks. Beyond the reviews, facts such as course architect and year opened add to the appeal of the Confidential Golf Guide. I never would have expected to see the Kankakee Elks Club in the book. But there it was, complete with a notation that it is a 1926 design of William Langford and Theodore Moreau. “A modest club in a blue-collar town, the Elks course is an audacious design, chock full of Langford’s bold greens and abrupt fairway hazards,’’ Doak said. “Unfortunately. . . [due to] over-planting, key parts of the strategy are no longer available for play.’’ Its rating: A 5 from Doak, the lone reviewer. Similarly, I was startled to see Jackson Park, an 1899 Tom Bendelow design, in the book. JP, as we call it, is a very modest short course on the South Side of Chicago. I’m sure it has undergone many changes since its Bendelow inception. JP received a 2 on the rating system. Which is a good call. I was also interested to see an entry for Briarwood, one of the many nice private clubs on the North Shore of Chicago. I caddied there long ago, but didn’t realize Briarwood is a 1921 C.H. Alison design. I still play there regularly, and know from the many changes that have been made since I was a looper, that Alison’s original plan has undergone massive alterations. I find it amusing that Briarwood, received a 4 and a 5 from Doak and one of his co-authors, while Kankakee Elks received a 5. Not only is Briarwood immaculate and much more challenging from a scoring standpoint, the caddie’s fee at Briarwood far exceeds the greens fee at Kankakee Elks. Then again, the bar at Briarwood has an excellent single-malt selection. Last time I was there, though, the Friday night fish fry at the Elks Club was not to be missed. Golf is where you find it. And the Confidential Guide is a great way to find it.